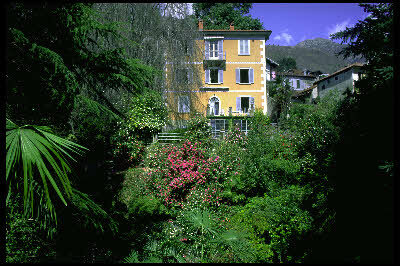 The garden of Villa Anelli, established in 1872 by the Milanese nobleman Carlo Berzio, is an example of Romantic style inspired by the aesthetics of the sublime, most notably the "Paradise Valley" through which flows the brook, "Rio delle Fontane". Currently the garden is run by the descendants of the founder. The site is on the Piedmont side of Lake Maggiore, 200 meters above sea level surrounded by high mountains, facing southeast. The garden is 5,000 square meters, lying on both sides of a creek. There are many terraces with stone walls. The garden is formed by an engaging variety of paths, views, and types of arboreal species; mature trees such as the weeping beech and the hornbeam were planted at the time of the foundation and are still alive to this day. Ever since its foundation, Villa Anelli has been deeply connected to exotic plants that came from the Far East and found an ideal habitat in the Villa’s garden. Within this context stood out the Camellia. 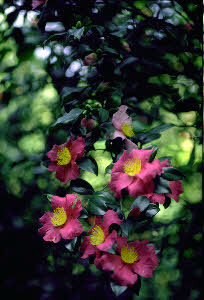 Undoubtedly the Camellia is the most widely spread species in the garden. Because it belongs in the group of acid-soil loving plants, it found here the ideal conditions for habitat: acid ground, mild climate, and frequent rainfall. Since the 1950s, Villa Anelli has housed a remarkable collection of camellias, developed with great passion by Antonio Sevesi. A mechanical engineer by profession, Sevesi was one of the outstanding authorities in the camellia world at that time, founder of the Italian Society of Camellias and one of the authors of the International Camellia Register. The camellia collection includes 500 plants of 318 cultivars that bloom in spring, 40 that bloom in winter, and 30 botanical species. It is organized in themes, such as the range of 19th century cultivars blooming in winter, botanical species, reticulatas from Yunnan and cultivars of Japanese origin. The garden is featured in numerous shows, the schedule for opening hours to the public, on weekends in the spring, is available on the website.